About 3 months ago, I walked out my front door on an ordinary Friday morning, and was surprised to see a grill sitting on the sidewalk. A grill with a red bow on it. Since then, I’ve been grilling up a storm. When I was in Iowa last weekend, I picked up some sweet corn. When in Iowa, right? I’ve had boiled sweet corn many times (and love it! 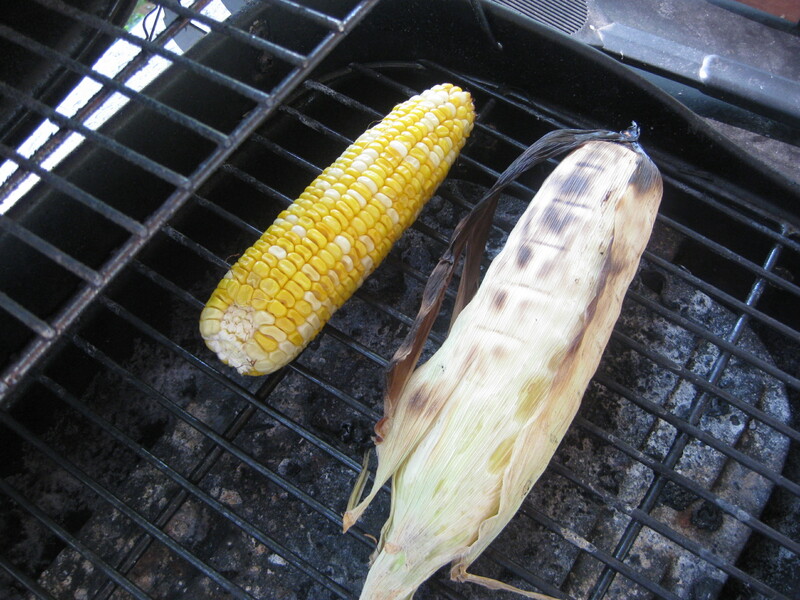 ), but, because of the new grill, thought I’d give grilled sweet corn a try. 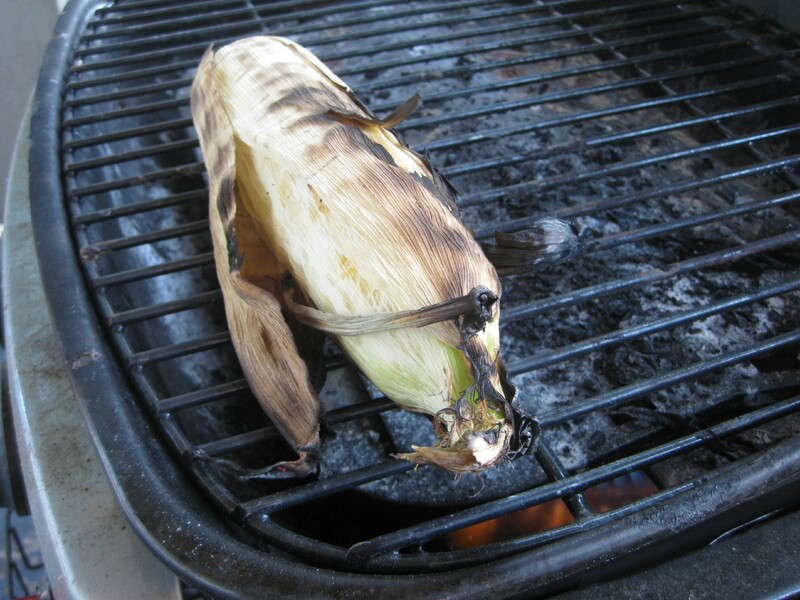 Corn in the husk takes a bit longer, but stays nice and moist and has a lovely smoked taste to it. It wins! Soak your ears of corn in a bowl of salt water for about an hour. Use 1 Tbs. of salt for every 2 cups of water. Lay the ears on the grill and rotate them periodically. They’re done when they have a slightly charred outside layer of husk all the way around the ear. This will take about 15-20 minutes. 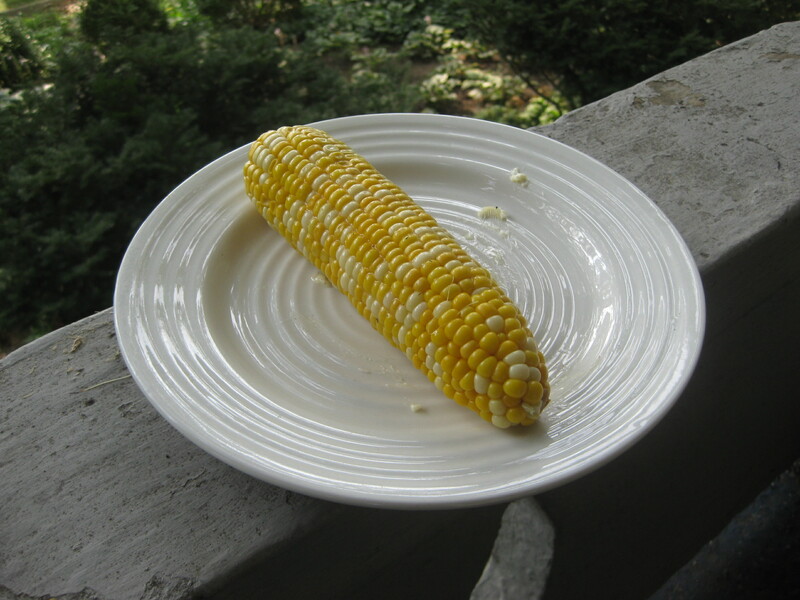 Husk, slather with butter, and enjoy, preferably while sitting outside on your back porch and enjoying the summer evening. I wanna know: What’s your favorite summer food? There is something about corn on the cob that just screams SUMMER to me! I’m inspired! I never would have thought about trying this. Now, of course, I’m going to have to. Lovely! Strawberry shortcake is quintessential summer goodness for me. So are grilled brats and potato salad. As a kid summertime favorites consisted of giant pots of boiled Ohio sweet corn, slices of summer sausages, cheese, sliced tomatoes and a dessert of watermelon. I’m glad that I just ate lunch, because otherwise that list would be too tempting!